CNS fungal infections present many diagnostic and therapeutic challenges and are associated with a high rate of mortality. While immunocompromised patients are the most susceptible to CNS fungal infections, they can also occur in immunocompetent patients undergoing invasive procedures such as neurosurgery and in patients exposed to contaminated devices or drugs. In 2012, for example, 384 patients developed fungal meningitis after injection with mold-contaminated methylprednisolone.3 In addition, heavy exposure to fungi in endemic regions can lead to infection in immunocompetent individuals. Aspergillus species. Aspergillus infections of the CNS are typically caused by Aspergillus fumigatus and “arise through hematogenous spread from the primary sites of infection (mostly pulmonary) or from contiguous anatomical sites, such as the paranasal sinuses.” While symptoms are largely unspecific, the most common signs include fever, focal neurologic defects, seizures, alterered mental status, and lack of response to broad-spectrum antibiotics. Predominant findings include focal lesions or brain abscesses. CNS infection with non-aspergillus molds most commonly involve mucormycetes, which typically affect the airways. Other non-aspergillus molds, such as Cladophialophora bantiana, Exophiala dermatitidis, and Rhinocladiella mackenziei are less frequent causes of CNS infection. The predominant clinical characteristics of CNS infection due to non-aspergillus molds include brain abscesses and, less commonly, meningitis and primary infection. Cryptococcus species. CNS infection due to Cryptococcus species is most often caused by Cryptococcus neoformans, with C gattii as a less common cause, and often arises from a primary lung infection. Meningoencephalitis is a typical feature of Cryptococcus infection of the CNS. Common signs and symptoms include headache, nausea, vomiting, impaired vision, altered mental status, and sixth nerve palsy. In patients with uncontrolled HIV infection, symptoms “might be absent or subtle before initiation of antiretroviral therapy; however, these symptoms can precipitate or worsen after a response to antifungal therapy due to immune reconstitution inflammatory syndrome following antiretroviral therapy,” according to the review. Candida species. Candida-related CNS infections are usually caused by Candida albicans, arise from hematogenous spread, and present with overt meningitis. Less commonly, these cases involve chronic meningitis, brain abscesses, vasculitis with cerebral infarctions, spinal infections, ventriculitis, and mycotic aneurysms. 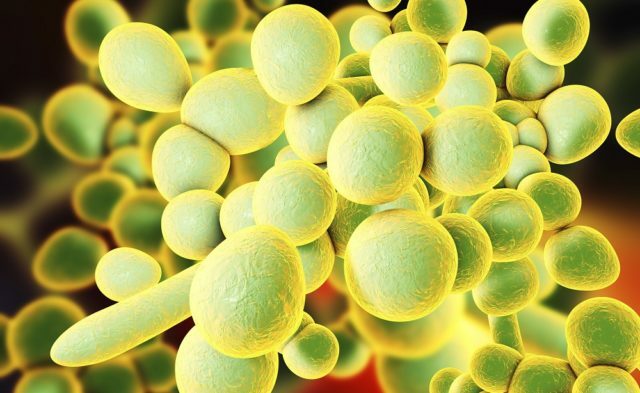 “Thus, the presence of CNS symptoms should raise the suspicion of a candida infection of the CNS in patients with specific risk factors,” stated the review. Dimorphic fungi. “CNS infections caused by dimorphic fungi are diverse and their signs and symptoms might be associated with the characteristics of both the host and the infectious fungi, including variations in neurotropism and immunosuppression,” the authors of the review wrote. Infection with these species is frequently caused by spore inhalation in endemic regions. Predominant clinical characteristics include meningitis, brain or epidural abscesses, spinal cord lesions, meningoencephalitis, and primary lung infection. The preferred diagnostic imaging tests for CNS fungal infections are computed tomography (CT) and magnetic resonance imaging (MRI), which facilitate detection of infectious lesions and associated complications and can inform the selection of interventions. CNS fungal infections often require treatment by a multidisciplinary team. The early initiation of antifungal medication is crucial, and the choice of medication should be based on its pharmacologic properties and available supporting evidence. Although the role of neurosurgical procedures in CNS fungal infections has not been well-defined, brain biopsy often facilitates definitive diagnosis. For cryptococcal meningoencephalitis and coccidioidal meningitis, shunt insertion may be required to reduce intracranial pressure. Early “surgical debridement might be particularly effective in patients with rhinocerebral mucormycosis and rapidly progressive necroses,” and resection may be warranted in “large, cerebral lesions (eg, cryptococcomas) with mass effects or enlarging lesions that are not explained by immune reconstitution inflammatory syndrome, or to verify the diagnosis,” the review authors explained. Neurosurgical intervention is rarely required in CNS infections caused by yeasts or dimorphic fungi. Often, patients who get these infections have impaired immune systems — from cancer treatment, organ transplantation, or immune suppressing medications, and therefore their response to treatment is often suboptimal unless the immune deficiency can be reversed. The infections are often hard to diagnose — while cryptococcal meningitis is easy to diagnose by spinal tap, other CNS infections might require a brain biopsy. There are far fewer anti-fungal drugs available compared with antibacterial agents, and since CNS fungal infections are less common that bacterial infections, there are fewer studies of the optimal agents and dose and duration of therapy. Finally, in the treatment of any CNS infection, penetration of the drug across the blood-brain barrier is of concern — some of the available anti-fungal agents are better than others. Gavito-Higuera J, Mullins CB, Ramos-Duran L, Chacon CIO, Hakim N, Palacios E. Fungal infections of the central nervous system: a pictorial review. J Clin Imaging Sci. 2016;6:24. Rajasingham R, Smith RM, Park BJ, et al. Global burden of disease of HIV-associated cryptococcal meningitis: an updated analysis. Lancet Infect Dis. 2017;17(8):873-881. Kauffman CA, Malani AN. Fungal infections associated with contaminated steroid injections. Microbiol Spectr. 2016;4(2). Schwartz S, Kontoyiannis DP, Harrison T, Ruhnke M. Advances in the diagnosis and treatment of fungal infections of the CNS. Lancet Neurol. 2018;17(4):362-372. Chong GM, Maertens JA, Lagrou K, Driessen GJ, Cornelissen JJ, Rijnders BJ. Diagnostic performance of galactomannan antigen testing in cerebrospinal fluid. J Clin Microbiol. 2016;54(2):428-431. Litvintseva AP, Lindsley MD, Gade L, et al. Utility of (1-3)-β-D-glucan testing for diagnostics and monitoring response to treatment during the multistate outbreak of fungal meningitis and other infections. Clin Infect Dis. 2014;58(5):622-630. Prakash PY, Irinyi L, Halliday C, Chen S, Robert V, Meyer W. Online databases for taxonomy and identification of pathogenic fungi and proposal for a cloud-based dynamic data network platform. J Clin Microbiol. 2017;55(4):1011-1024.